Two recent events have inspired a slew of bad reporting in the UK about animal research. The first was a vote in Parliament rejecting a call to describe animals as sentient into British law. The second was the publication of the Northern Irish statistics. What seems to have been ignored is that the protection of sentient animals is already embodied in British law. 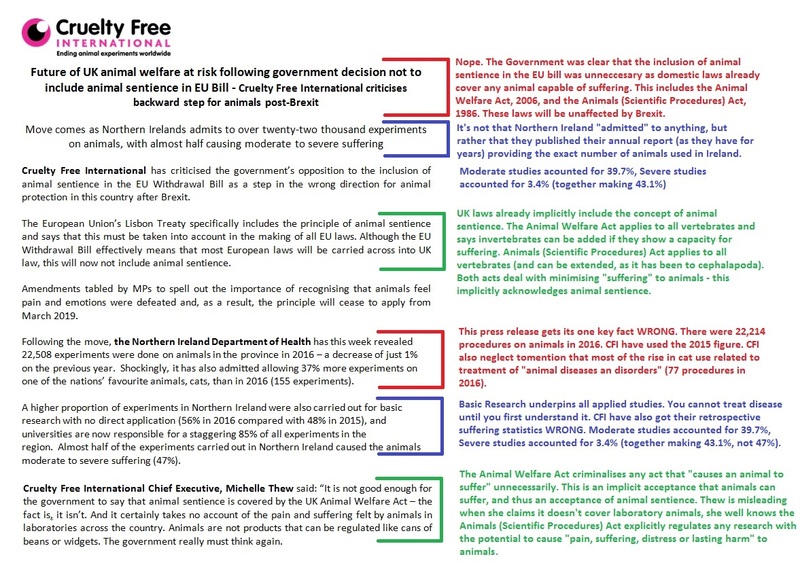 Most animal use is governed by the Animal Welfare Act, 2006, which protects any animals where an: “appropriate national authority is satisfied, on the basis of scientific evidence, that animals of the kind concerned are capable of experiencing pain or suffering”. The act also includes provisions to be extended to invertebrates if they seem to be able to suffer or feel pain. Essentially the Animal Welfare Act is an entire piece of UK domestic law dedicated to protecting sentient animals. For animals in laboratories, the relevant legislation is not the Animal Welfare Act, but the Animals (Scientific Procedures) Act, 1986 (better known as ASPA). This act protects all vertebrate species, and invertebrates considered potentially able to suffer or feel pain (currently only cephalapods). The act covers all “regulated procedures” defined as those “which may have the effect of causing that animal pain, suffering, distress or lasting harm”. Importantly, both of these acts are in domestic UK law, and so will not be affected by any future withdrawal from the European Unioin. So it seems odd that someone would claim the Government dos not believe that animals can feel pain. Under EU law it is illegal to test on animals for cosmetics like body wash and nail varnish. But this could easily be scrapped just like the recognition of animals as sentient beings has been. We are looking at a very grim future for animals, where hunting is reintroduced, labs are free to test on animals with as much cruelty as they wish (and no pain relief) and farms are less and less regulated. Necati may wish to note that the UK had already banned the use of animals to test cosmetics or their ingredients in 1998 – a full fifteen years before the EU laws came into effect. So it is unclear why this domestic ban would change upon leaving the EU. Similarly ASPA came into law in 1986 – 27 years before the EU Directive 2010/63 covering animals in research across the EU. Importantly, ASPA, 1986 was updated in 2013 to transpose aditional laws brought about by the EU Directive – this means that the EU Directive is effectively within UK law and will remain unaffected by Brexit. We also recognise and respect the fact that animals are sentient beings and should be treated accordingly. The Animal Welfare Act 2006 provides protection for all animals capable of experiencing pain or suffering which are under the control of man. But I reaffirm to her that we will be ensuring that we maintain and enhance our animal welfare standards when we leave the EU. 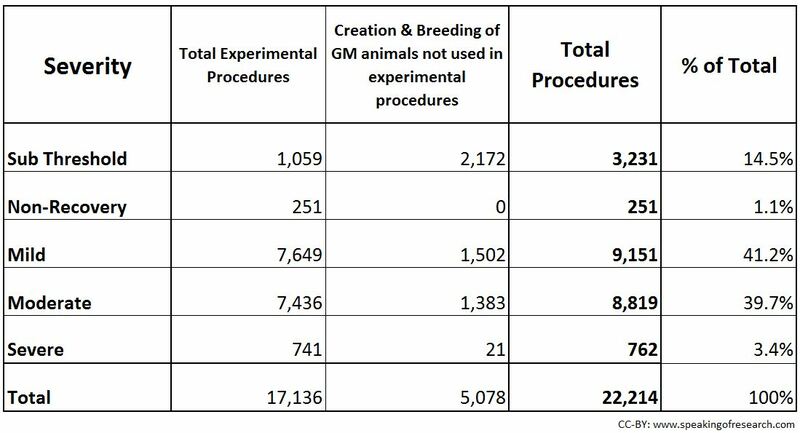 This is not the first time CFI have misused the severity statistics by neglecting to include experiments involving breeding and maintaining GA animals. See the table below for the full statistics (CFI only looked at the column marked “total experimental procedures” despite clearly referring to all procedures in their press release (see first blue section). Speaking of Research will continue to call out nonsense and misinformation wherever we see it. Posted on November 23, 2017 November 27, 2017 by EditorPosted in #ARnonsense, News, StatisticsTagged CFI, cruelty free international, parliament, sentience, The Independent, UK law, yas necati. Next Next post: Research Roundup: Vaccine for Type 1 diabetes, refinement of stroke models leads to less animals used and more!